As I mentioned before, Maison Premiere has been on my summer bucket list. Since my office was closing early on a Friday, I immediately checked my list for any places that would be practically necessary to visit before 5pm on a weekday. And Maison Premiere was it! I quickly emailed my friend, who is one of the many lucky ducks in the City enjoying Summer Fridays (early dismissal!) at work. Maison Premiere is a cocktail bar that specializes in a large selection of absinthe, and serves quite a variety of oysters. Every Monday through Friday, the bar offers a happy hour from 4pm to 7pm where all of the approximately 20 types of oysters are $1 each. Try to get there as close to 4pm as possible. We arrived right when it opened, and by the time we sat down, all the tables and stools were filled. There is a really interesting old school vibe here. It feels like you've stepped back in time. The servers are dressed up in suspenders, vests, and bow ties, and there's jazz music playing softly in the background. So many oysters to choose from. We wanted more slightly sweet ones, so we went for 5 west coast and 3 east coast oysters each. GLS Aphillathes Rose, $8; American Darling Beer, $8. Being a cocktail bar, there were a lot of appealing drink options, but I really didn't want anything too strong, as it was very hot out and I just wanted something cool to sip on while waiting for the oysters. 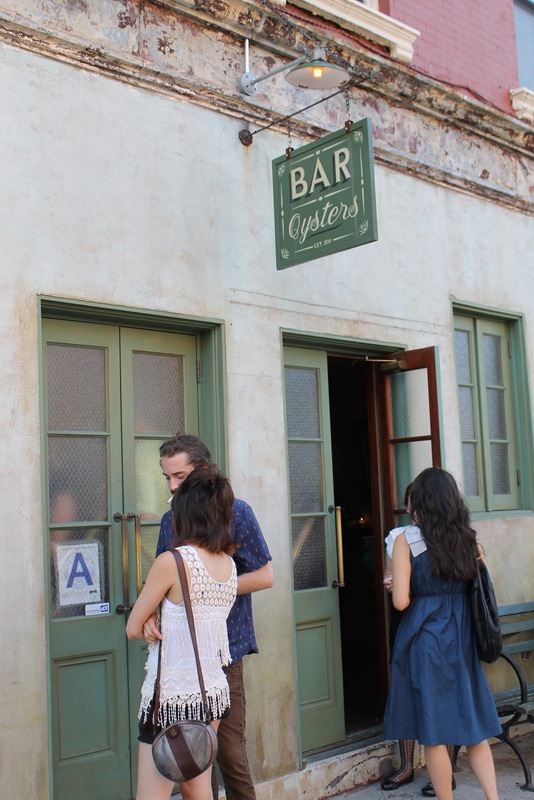 Be prepared to wait a minimum of 15 to 20 minutes for the oysters! (They are shucked upon order, so they do take some time). Our 16 oysters. We were happy. A very simple but pretty postcard attached to the cheque. Afterwards, I wanted to sneak a peek at the garden in the back. Definitely a beautiful place to sit in the fall, or anytime it's not over 30 degrees celsius out (which it was that day). Oysters are shucked next to the bar in the outdoor area. Sewansecott: sweet & delicious, probably my favorite of the bunch. Gold Creek: silky & creamy.